A few people have asked me about the photo I use in my profile here, so here's its spooky story. This is the Black Angel of Iowa City. 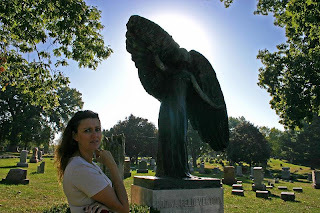 Found in Oakland cemetery near the university, the Black Angel's story is mostly mythical, although the true story is no less interesting. But, first, here is the legend. This stunning 8 foot memorial statue sits upon the final resting place of the Feldevert family. Standing since the early 1900's, this originally bronzed statue has turned black with normal oxidation, but that hasn’t stopped the lore's and legends from deeming it a more supernatural occurrence. Some claim that Theresa Feldevert was somehow evil and that is the reason the angel turned black. You see, Theresa's son died at the age of 18 due to meningitis, but people gossip that perhaps it was murder. Doubtful. Others say that the angel was struck by lightening and turned black. That by some supernatural occurrence this angel was deemed to have paranormal powers and to stand too close would lead to harm. The true story? The angel was commissioned by Theresa for her family plot and created by a bohemian sculptor. The angel didn't turn out to be the price Theresa had bargained for and the stunning statue remained crated up for some time until the lawsuit was settled. Finally, the angel was placed over the burial plot of her son (whose smaller tree trunk monument can be found under the bush nearby) and ashes of her husband. Today, this breathtaking statue brings college students to dare to kiss beneath it, for if you kiss beneath it, you will die the next day. Others say if you look into her face you will die, or become ill. Interesting note: My husband Norm and I went there before we had actually moved to the area to check it out for ourselves. As I took picture after picture Norm wandered away to answer natures call, yes, right there in the cemetery. Later that day he was struck down with flu-like symptoms and was ill for several days. Was this the Black Angels revenge for his disrespectful kidneys or did we just have a bad beer at the local brewery? Hard to say, but I say, don't chance it. Pay your respects. Urban legend still lives on! This is like "The Ring" or "Friday the 13th". If people have been dead or severely ill due to either kissing or rubbing the thing mainly because the opened their minds about getting ill or die. They programmed their brains in doing so which can subconsciously decrease immune system which could later on lead to death. Really scary story. There are probably different reasons why those things happen. Poor angel was condemned to be an urban legend. I visited the Black Angel in Sept 4,2011 and took alot of photos, many up close. I didn't actually touch the angel, but I did stand on the concrete base. The very next day I woke up with the worst abdominal pain ever and by that evening I was in the operating room having my appendix removed. I didn't believe in the legend before, but now I'm not so sure and I would advise anyone to be careful and respectful and not to touch anything. I'm not so sure that taking photos is a good idea either.